If I had to choose between eating pumpkin pie and attending the elementary students’ Thanksgiving All School Meeting, the All School Meeting would win hands-down. Today was my lucky day. I went to the meeting, then 3rd grade teacher Melanie Benefiel shared her pie. Double happiness. All School meetings at the elementary campus bring every student – and lots of parents – together every week in the Commons where, as a community, we share songs, news, stories, and lessons kids have learned in their classrooms. The Thanksgiving All School Meeting is a particularly special event. Every child participates, and each class brings an “offering” to the school Thanksgiving table, which is set in the center of the room. Jasmine K. and Milo M. lead the Thanksgiving All School Meeting. Eat locally and sustainably. Second graders advised the audience to “learn where your food comes from” and be aware of chemical fertilizers that “are not good for animals or people.” Vegetables and fruits make you healthy, and “organic means not people-made, but earth-made.” Students read the story Little Yellow Pear Tomatoes by Demian Elaine Yumei and contributed a copy of the book to the Thanksgiving table. Eat seasonally. 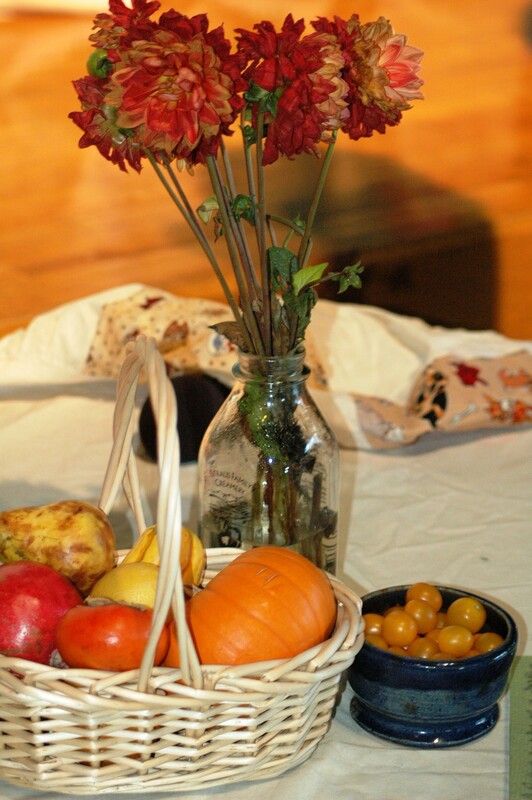 “Eating seasonally gives you a sense of time and place,” a 3rd grader explained. Third graders talked about the field trip they took to a pumpkin farm, sang about pumpkin pie (holding handmade paper pumpkins that bounced to the beat) and presented a pumpkin pie to the Thanksgiving table. Shop at farmers’ markets. The Pods told everyone about their field trip to the Santa Monica Farmers’ Market, where they interviewed farmers and got to taste all kinds of fruits and vegetables. They brought back a bounty of produce to their class and offered a basket of farm-fresh goodies for the Thanksgiving table. “Food tastes better when it’s fresh and local,” a little Podster explained. Plant a garden. 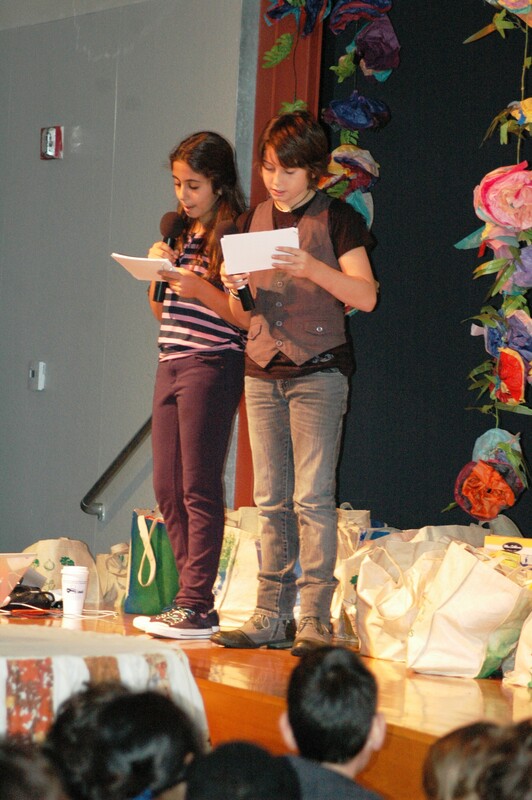 “It is deeply satisfying to eat food you’ve grown yourself,” a 5th grader told the audience. As part of their study of early American history, the 5th grade is growing a colonial herb garden in the new outdoor classroom. Each student brought in a recipe from home that incorporates one of the herbs, and the class combined all of the recipes to create their own cookbook. A copy was placed on the Thanksgiving table. Cook together. Fourth graders brought a pot and ladle to the table to symbolize this simple idea, and each student shared an excerpt from a creative writing assignment in which they expressed the smells, tastes, sounds, and sensations of Thanksgiving: “sweet potatoes with sweet white marshmallow topping,” “the sounds of pans banging against each other as my family begins to cook,” “the bubbling and sizzling of bacon cooking,” and “the scent of cinnamon from the apple pie.” Hungry yet? Remember food is precious. Meeting leaders Milo and Jasmine presented this final principle. “Food should never be taken for granted,” Milo said. Jasmine told everyone to “remember those families who may not have all that we do.” The pair congratulated Wildwood for coming together for this year’s Thanksgiving Food Drive to contribute 56 bags of food and 18 gift cards to families from St. Joseph Center in Venice. “This food is the gift of the whole universe/each morsel is a sacrifice of life/may I be worthy to receive it./May the energy in this food/give me strength/to transform my unwholesome qualities/into wholesome qualities./I am grateful for this food/may I realize the path of awakening/for the sake of all beings.” Happy Thanksgiving. Each grade presented an offering for the Thanksgiving table. The spirit of the event has been beautifully captured – thank you!